Finding the perfect foundation can often feel like an impossible task, especially on the High Street. Very often the foundations are either too thin and chalky or thick and paste-like. Frequently they're too pink, too dry or too streaky. While I believe that with most things in life you get what you pay for, it seems the High Street is finally catching up and producing great modern foundations. Certainly to be favourably compared to any highly priced designer competitor. Here are the ones that have quality and amazing shades for a very reasonable price, in-keeping with the most expensive brands around. Available in 23 shades and matches 98% of UK skintones. L'Oreal's velvety formula matches your skin’s unique tone and texture, for a true to skin finish: flawless, blendable, and never fake. It has a lightweight consistency and will suit most skin types. If you're a big fan of Armani’s iconic Luminous Silk foundation this is an excellent alternative that is much more purse friendly. This is my number one of our favourites. A light, smooth texture for natural, 100% poreless coverage instantly eliminates signs of tiredness and lifts skin from fatigue. Radiance pearls illuminate for a healthy, radiant glow. Flawless natural finish. Peptides increase elasticity so skin recovers and bounces back more quickly. SPF 15 protects. This foundation is ideal for dull skin if you’re craving dewiness and happens to be Dani’s go to. Specially formulated for combination or oily skin, this oil-free formula helps control shine for a perfect velvet-matte finish.A buildable formula that blends seamlessly onto skin for a perfectly even, yet truly natural complexion all day long. 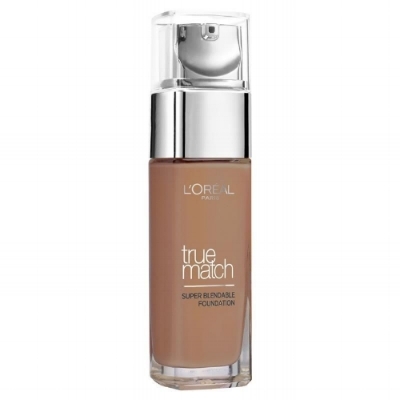 This magical foundation has incredible long-wear and buildable coverage. Give your skin a boost of radiance with Bourjois Healthy Mix Serum Gel foundation. Made from a vitamin-rich fruit therapy formula for an even complexion and an instant anti-fatigue result! Its fresh and instant blending gel texture blends and easily glides onto the skin for an even, natural finish with no mask effect.This foundation is ight and fresh, it’s non-greasy and nicely hydrating so suitable for just about every skin type apart from if you have very oily skin. When talking about value for money, this Max Factor 3 in 1 beauty has to come up top trumps. A marvellous multi-purpose product that acts as a primer, concealer and a foundation. This foundation primes the skin with a flexi-hold technology that creates a strong yet lightweight film which sits comfortably on the skin. Next, micro-correctors within the formula operate like little mechanics to defend against external influencers like sweat and sebum, correcting and maintaining the look over time whilst preventing shine. 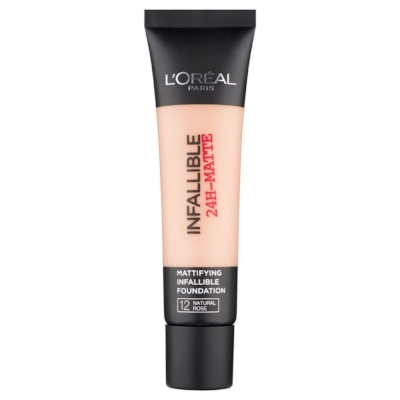 New Infallible 24HR Matte Foundation by L'Oreal Paris. A matte result that lasts up to 24 hours. Clinically proven; waterproof, steamproof. All the comfort, none of the shine. Perfect coverage. No Cakey effect. Easy to apply, enriched with perlite technology, and reduces the appearance of shine up to 24 hours. This is the perfect foundation if you have oily skin and want full coverage.